Michael W. Smith, MercyMe, Don Moen, Darlene Zschech, SONICFLOOd, Todd Agnew, Israel & New Breed and Phillips, Craig & Dean lead the impressive and diverse artist list on iWorship Next, the next wave of new music in the unparalleled iWORSHIP series. Some of today’s biggest worship songs, including “Word of God Speak,” “Agnus Dei,” “I Can Only Imagine,” “Breathe,” “He Reigns” and “Here I Am To Worship” make up the 33 tracks on the two CDs. 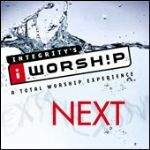 iWORSHIP Next is the next phase in what Integrity calls their “Total Worship Experience” series, and is produced in partnership with Maranatha! and INO Records. It will also offer, in addition to the double CD set, a new innovative transposable CD-ROM songbook and CD trax. Concurrent with the release of iWorship Next, Integrity will also release the latest in the line of resource system DVDs: iWorship Resource System, Volume I. The transposable songbook features all songs transposable to any key and ready to print in a variety of formats, and the DVDs offer what has become one of the hallmarks of the iWorship series: the advanced audio-visual presentation features that give worship leaders and music pastors options for creating a personalized worship environment. The DVD, iWorship Resource System, Volume I, contains a great mix of seven top worship songs including Michael W. Smith’s brand new radio hit, “Healing Rain.” Smith’s “Agnus Dei” is also included along with “Arise,” featuring Don Moen; “At The Foot Of The Cross (Ashes To Beauty),” featuring Kathryn Scott; “Days Of Elijah,” featuring Robin Mark; “Praise Adonai,” featuring Paul Baloche and “When It's All Been Said And Done,” also featuring Don Moen. Since the initial release of the iWorship series, these resource system DVDs have become immensely popular with worship leaders and congregations worldwide. With the ultimate goal of giving believers a total, well-rounded worship experience, Integrity Music introduced the iWorship product line in 2002. So far, the product series includes three double CDs, a children’s CD, a Christmas CD, songbooks, CD trax, devotional books, a Bible and DVDs created for use in home and corporate worship settings. Look for iWORSHIP Next here at Songs4Worship.com in October 2004.